Tamar. – Dirty wet dog , boats and sailing. Home is currently the Tamar river just to the north of the Hamoaze and Plymouth sound, its quite a long tidal river which officially starts down at the road and rail bridges at Saltash, wiggles and bends its way up past Weir Quay and Calstock, has a limit of practical navigation at the tidal weir just near Gunnislake and then turns into a much faster fresh-water river above that. I have explored most of it either by boat or on foot : some time i must have a go at running a canoe or surf dory down the rapids above the first road bridge at Gunnislake. In winter it feels like a much lonelier and wilder place which is just how i like it, for a long section there are hardly any houses on the river so its just about possible to anchor out of anyones sight. I seem to be able to get up and down the river at any state of the tide except that i need my boards up on a low spring as there are both shallow sections and river-bed debris. The railway viaduct at Calstock which is still in use with a service from Plymouth to Dobwalls (gunnislake) air draught is plenty for WABI. 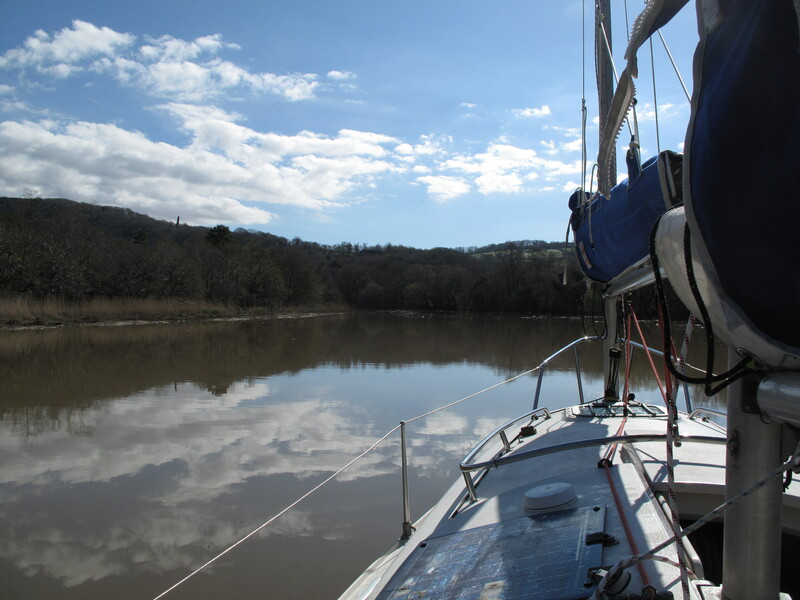 What i often do when i get aboard is just have a look at what the tide is doing :if its still flooding i will just cast off and motor upstream for 10 minutes or so and anchor in a quiet spot upstream. Downstream the river broadens out a bit passes Halton Quay and Pentille castle and then turns a big double bend just to the north of Weir Quay , that section of the river is dense with moorings : i kept my Frances 26 there for a year while working on the first stage of the refit.